For the past 7 years we’ve quietly helped Stagecoach successfully recruit high quality graduates via their annual campaign, many of whom are now Directors in the business. According to recent research from the Guardian, graduates rank the transport industry as one of the sectors they’d least like to work in, and bus companies fare worse than train operators! In light of this, our challenge was to attract sufficient high-calibre candidates to fill Stagecoach UK Bus graduate trainee roles in general management and engineering management. Our campaign centred on a specially created recruitment website, with full online application. The attraction strategy was primarily web-based, and backed up by careers fair and press advertising. The key to the creative work was focusing the message on a single clear proposition. 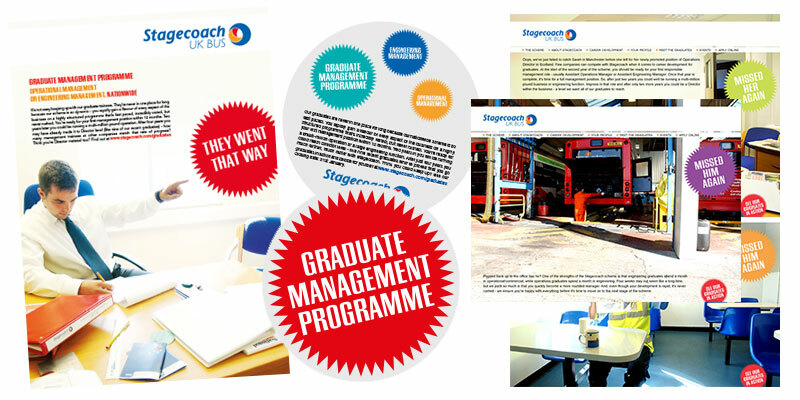 Stagecoach graduates progress far faster than the average graduate. Effectively, they can be running their own business in less than five years. So, instead of using a bus or transport-related theme, we concentrated on the rapid development of graduates’ management careers using the real experiences of graduate trainees from previous years. But, rather than using a traditional testimonial approach, we did something different – a spoof of traditional case-study based advertising and websites. The result was a threefold increase in applications compared to the previous two years. The standard of applicant was also noticeably higher – all vacancies were filled from a much stronger shortlist than was anticipated.